Set of four sea glass wine charms. Cobalt blue, sea foam, white and green sea glass. Sea glass earrings In autumn colors of amber gold, caramel brown and olive green. A great addition to your fall wardrobe.See more details here. 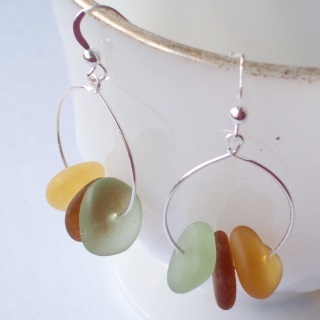 I create hand crafted sterling silver jewelry featuring beach and sea glass. My beach glass designs use only real, natural beach or sea glass. What's the difference between sea and beach glass? 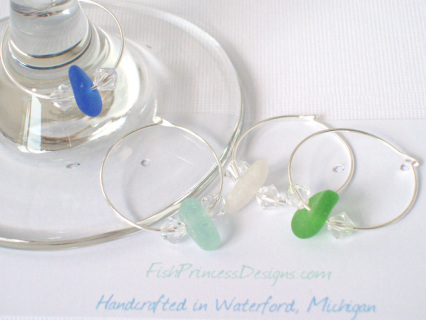 Sea glass is normally used for glass that has been found along the oceans beaches, while beach glass usually refers to inland lakes-such as the Great Lakes. Natural beach glass comes from old bottles, jars and other glass items that have been discarded in oceans and lakes and was tumbled naturally by waves and sand over many years to form the smooth and frosty look of the glass. It can take many decades for beach glass to be formed. The sea and beach glass I use has been unchanged from the way it was found. The only change to the glass pieces may be the holes drilled into them, otherwise they are just the way they have been found on the shore. Never artificially tumbled or formed. White pieces started as common clear glass, while the less common sea foam green pieces were most likely discarded soda bottles. Brown or amber glass usually started as beer or ﻿medicin﻿e bottles. Cobalt blue may have started its life as Vaseline or Milk of Magnesia bottles! Whatever the source, my sea glass has become naturally weathered and smoothed over time. My sea and beach glass comes from various beaches including the Great Lakes, Hawaii, the Caribbean and the Pacific and Atlantic coasts. Many of my multi-colored sea glass pieces are rare pieces of English sea glass, also known as "end of the day" sea glass. All my glass is either collected by myself or friends, or purchased from trusted vendors. While I mainly concentrate on beach and sea glass creations, as you browse through my pages you will also find Petoskey Stone, Leland blue and slag glass creations, celebrating my Michigan roots. I am always adding new items to my site, so bookmark me to easily find my newest design. Have you seen something from FishPrincessDesigns at an art or craft fair that isn't listed on the website? Well that's what the contact me button is for! If you "like" me on Facebook or want to follow me on Twitter or Pinterest just use the links below. I preview some of my latest creations there and let you know about upcoming events at FishPrincessDesigns.